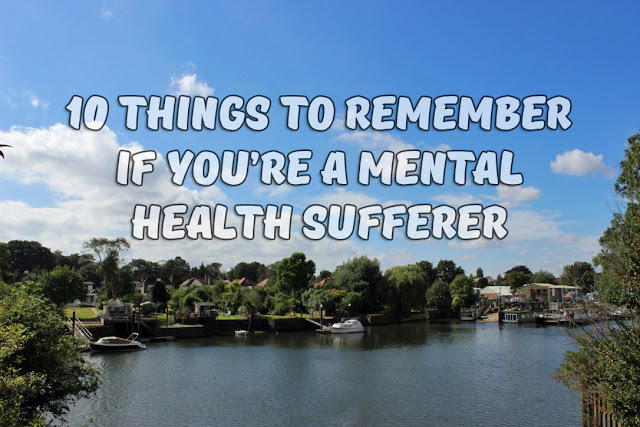 Whether you suffer from a mental health issue severely everyday or are occasionally hit by low moments, we all need to be kept inspired and motivated to keep going. Here's 10 things I think everyone should remember when the going gets tough. 1. A task that one person finds simple, can be virtually impossible for someone else. That doesn't make you weak or a bad person, it makes you different. Remember, you can do things others can't. 2. Just because your battle isn't physical, doesn't mean it isn't valid. You're a hero too, for getting through 100% of your days, both good and bad. 3. Be kind to yourself. If you were physically ill, you'd give yourself time to heal. Mental illness needs to be treated the same way. You need recovery time. 4. It's always okay to ask for help. You may feel lost, confused and isolated but reach out to someone, anyone, or accept a helping hand. Don't feel as if you have to suffer alone. 5. Your mental health condition doesn't define you. It is a part of you, at least for now, but if we looked up your name in the dictionary, it would not just say 'mental health sufferer', it would say so much more. 6. It's okay not to be okay. Whether everyday is a down day, or just once a month, you're not worth less than anyone else. 7. You survived every single bad moment. The days you convinced yourself you were never going to get through, you did, and you're still breathing. 8. Don't compare yourself to others. It's easier said than done but you have no idea what the struggle is behind their exterior. Remember, even those with the CEO positions, flashiest cars and expensive mansions aren't immune to mental health problems. 9. You're alive and so much stronger than you may realise right now. People love you, you've made strangers' days and have so much to offer. 10. It's never too late to turn things around and there's no such thing as wasted time. Life will get better. Look forward, not back. Sometimes, we all need to be reminded of how incredible we are. What advice do you tell yourself, or others when they're having a bad mental health day?